I don’t know the definition of a hollow form but it seems like if the opening is smaller than the inside diameter, it’s a hollow form. In any event, fun to turn, very difficult to sand! It’s formed and it’s hollow. It looks good, I like the live edge on it. I’m not sure if there is an “official” definition of the difference between a hollow form and a bowl who’s getting too big for it’s britches, but I’d say this was more hollow form than bowl. You take it to a craft/arts show and folks pick it up. If they ask “What is this?” and you tell them (a hollow form) their next question will be “What is it for?”. If they ask “What is this?” and you tell them (a hollow form) their next question will be “What is it for?”. HA! I love the explanations and comments. Well, I used a hollowing tool. With the bark hanging over the edge, there was no way I could get a gouge inside. Therefore, I declare it a hollow form! Thank you all for your comments, truly appreciated! 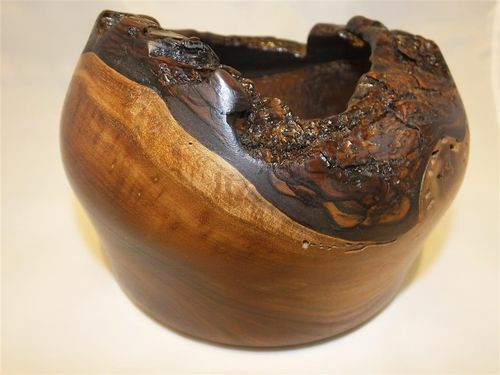 Hollow form or bowl – in the eye of the beholder. I would classify it as a bowl, I think based on the base/max/opening diameter ratios, but thats my eye. Very nice either way. I bet the inside was fun to sand. You bet right, LOL. It was NOT fun to sand!